Hector is a young hispanic kid who goes to high school, everyday he tells his struggles in being treated equally from the other students and even the staff, he tells how he is given less opportunities than other kids in his school and this is not fair to him nor his education. Many people feel that everyone should have the same rights and opportunities, a word for that is ‘Equality’, you hardly see it these days because, wealthy people think they are better and deserve more opportunities than the middle and poor classes, Blacks are not being treated equal by cops or other races, and foreign people do not get the same opportunities as white people in the United States. Many people who live in the United States want to change this for the better, so no man or women will get treated differently than others that certain men and women believe deserve more. Everybody deserves the same rights and opportunities in life, god did not put these citizens on the earth to live a horrible life judged by people who believe that they are higher in social class than the other. Lack of people having the same rights is a large issue in the United States today. Black men and women do not seem to be treated fairly with the same rights as white people. The evidence is around us, we always see news on the tv about a black man or woman not being treated fairly. Everyday, in school, at work, in public and at events, we see them getting treated like no man or woman should be. With this, it gives the blacks and the poor society hardly any chances in life or chances to make their life better. Lack of not having the same rights as everyone makes it to where they don't have the same chances in life to be something big, and I do not believe that just the higher society should have those opportunities, those opportunities are made for every human. For example, Often blacks get judged on how they look and that doesn't allow them to have the career they want to strive for. Many people look at black people or hispanics and other races and do not want to hire them because of how they look, that is like judging a book on its cover, and sometimes the book is extraordinary, but not giving these people the chances in life to get back on their feet is the reason we see all these “poor black men, women and hispanics” because we do not give them the chance. Many men and women who are not apart of the wealthy class hardly get chances to bring themselves up from the lower classes. If you are a lower class citizen it is hard to fight your way to the top, it is almost like you are stuck at the bottom. It says that in the United States there are ⅓ lower class citizens and the other ⅔ are wealthy and are in the upper social class, this means that there are nearly 107,000,000 citizens that are struggling in the U.S. This is not fair to most of these struggling men and women. The government makes it hard for lower class citizens, by saying this, it means that the government only tries to help the upper class when they are not even the ones who need help. The government even makes them pay more for taxes than the wealthy class. To many, this is a sign of judgment by our own government. The government gives the wealthier more chances for jobs and opportunities, I understand they do this because usually the wealthier class have college degrees and “deserve” it, but at the same time, they have to think about the lower class citizens and think about giving them a chance to regain control of their life, and the government has not done so. Some people believe that wealthy people get more opportunities and rights because they did the right thing and deserve those chances in life. They think wealthy classmen deserve more because when they were young they succeeded in life and deserve those opportunities. This is not true because some lower class people actually are veterans from war and when they get back from the military or navy they have nowhere to go and this is not their fault, but the government insists on not helping them either. Some innocent citizens are stuck on the ground and can not get back up because of something that happened in their past life that was not even their fault, so it is almost like they are getting punished for absolutely nothing. Everyone deserves a chance to get back on their feet and this is not fair to them because all they want to do is fix their life and the government and people will not let them. 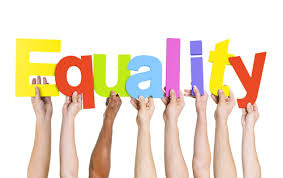 There are many solutions for lack of equality in the United States. One would be to make judgmental free clubs around the US, this is clubs that come together to stop racism and inequality of citizens. This will help people realize that everyone deserves the same rights, poor or wealthy, white or black, and hispanic or American, this will show them that every human is worth the same and one man should never be held above another citizen. It would help for people to get along better and realize just that everyone is equal and there will be respect in the atmosphere once again. The Government should stop giving the wealthier people more chances than others, because everybody deserves a second chance. wealthy people already have it made, the people who deserve the chances and opportunities is the poor or under class citizens, especially the people that are in the place that they are in now and it is not their fault what so ever. This will not only help the lower class people get back on their feet, but also the men and women in between, which is the middle class. “I look to a day when people will not be judged by the color of their skin, but by the content of their character.” This is what Martin Luther King said during his speech. This means that he wished for everyone to be equal and not judged upon the color of their skin nor where they are from. He believes that everyone is equal no matter where you are in economy. Everyone deserves to be equal. Nobody deserves to not have the same rights as any other person. In this quote he speaks just about color, but I can assure you, that is not all who had meant those words for, he was not only talking for the Blacks and the Hispanics, not only the Asian and Indian culture, but he was also talking for the society classes. No man or woman should have to go through the suffering of not being treated equal to people who just have more money than them, it is sickening and something to save us needs to happen soon, or lack of equality will be the downfall of the United States. North, Anna. "Biggest Challenges of 2016." The New York times. The New York times, 6 Jan. 2016. Web. News Office. "2016's Top Legislative Issues to Watch." Governing. News Staff, Jan. 2016. Web. Guns are a huge problem in America and cause many innocent lives every year. End this huge cause of death and make guns illegal.